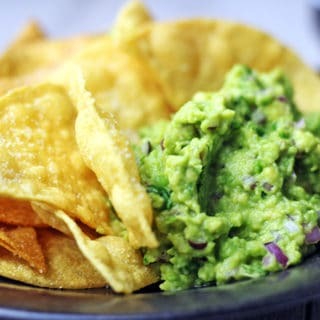 You've had the Barbacoa Beef Burrito, now you can enjoy the Chips and Guacamole that go with it! Salty Lime Tortilla Chips just like you love at Chipotle served with their authentic guacamole. You'll never want premade chips or dip again! Cut the chips into six even triangles. Heat your oil to 375 degrees. If you don't have a thermometer, drop one chip in the oil and if it comes to the surface bubbling the temperature is good. Cook for 20-30 seconds, you aren't looking for them to brown. To make the guacamole choose two nice ripe avocados that are dark green on the outside. Cut avocados, remove pit and scoop out and into a bowl. Add two teaspoons of lime juice and salt and mash together until smooth. Add in the cilantro, red onion and jalapeno. Mix well and serve with chips. Recipe for Guacamole is straight from Chipotle! Authentic and everything!